Since our return home from our North American tour life has returned to a normal state. Aside from another bout with the dreaded Hand, Foot, and Mouth disease things have been good. With some help we were able the affront to horticulture that was our front shrubs. 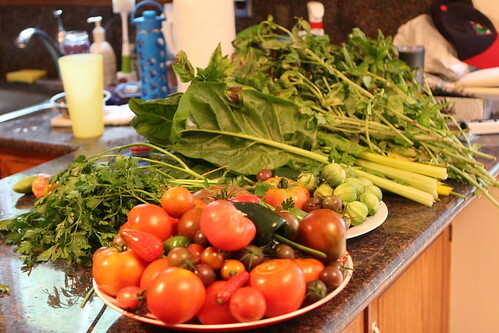 We harvested many more vegetables form our garden. We made lots of fresh tomato sauce which, despite the look on his face, Elliott has enjoyed quite a lot. Martin has assisted me on the "Garbage-Q" which is how he now refers to the barbecue. We babysat Evelyn for a weekend. We picked up a lot more vegetables from our farm share. And, the cousins enjoyed eating huge amounts of ice cream. 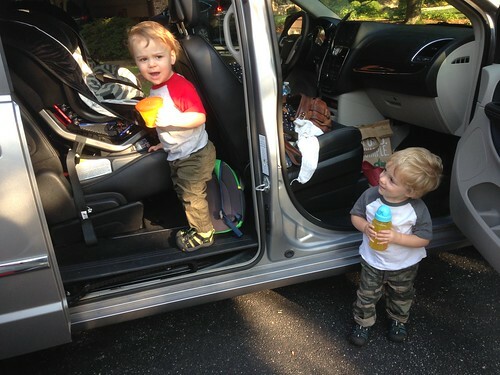 Recently the boys have not wanted to sit in their stroller for their walk home from daycare. 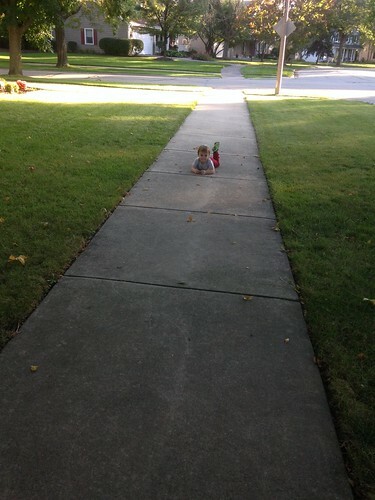 They would much rather walk by themselves, or as they would angrily yell it, "I do myself!" This has turned a normally enjoyable 10-minute walk into a 45 minute odyssey complete with picking flowers, trying to walk into our neighbors' yards, not wanting to hold my hand while crossing the street, and sometimes wanting to be carried the rest of the way. It all begins with stalling as we try to leave daycare. 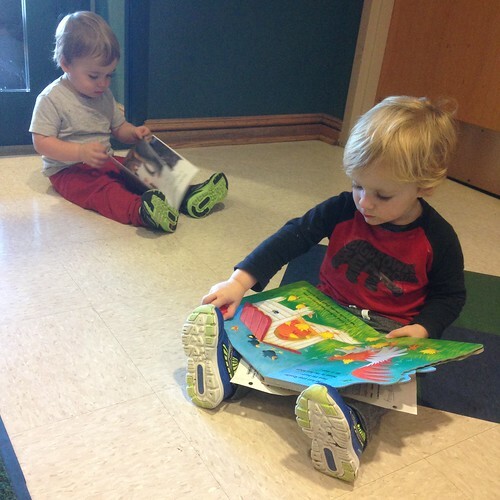 They recently set up a book fair at our day care which means they continually try to take books from the shelves and read them in the entryway before leaving. Then, as we walk along a busy street, they try to pick flowers, plants, and large sticks up to carry with them on the way home. They try to sit down on tree stumps to take a break. And, on occasion, Elliott just lies down on his belly on the sidewalk and refuses to follow me home. 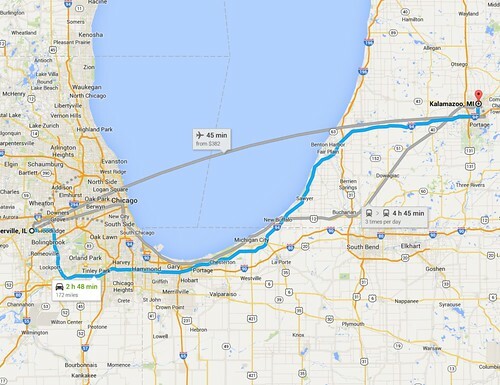 This week marks the one year anniversary of our move to Illinois. It's hard to believe it's been that long since we said goodbye to New York. It will be nice to not have to spend all of this fall looking for and moving into a new house. Maybe we'll even get more than a ten day lead up to Christmas to mentally prepare the boys (and ourselves) for the festivities at hand. 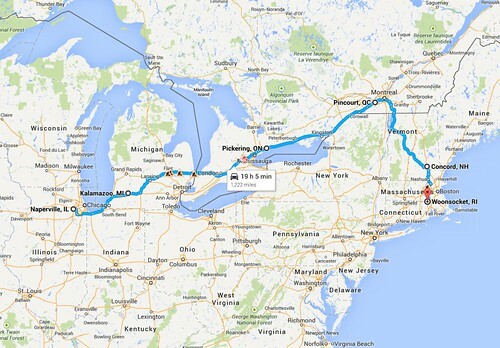 Two weeks ago began our great North American adventure. 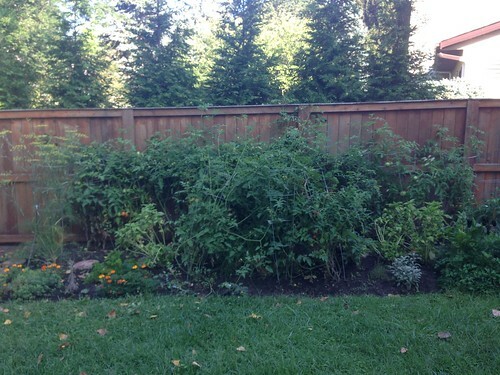 It began with a massive harvesting of all ripe tomatoes in our giant backyard tomato jungle. 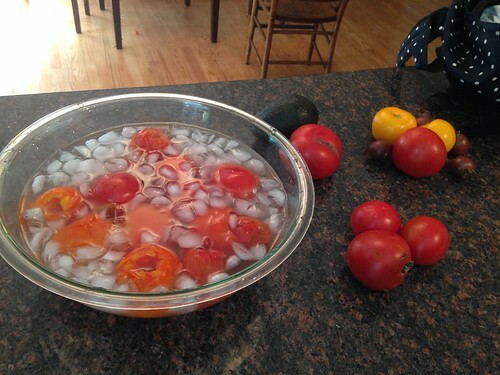 I spent the afternoon before the trip performing a culinary task I once deemed pointless by blanching, shocking, peeling, and chopping them all for the freezer. 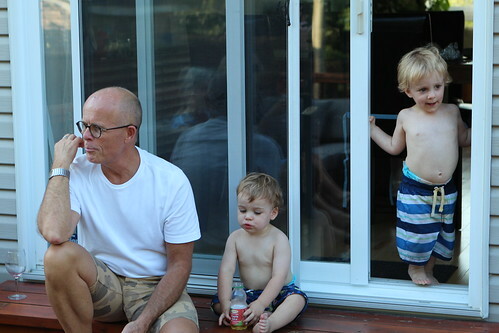 Since Jen had to work late I got the boys early from day care and had a little backyard pool party for them to celebrate the start of our North American tour. The next morning we packed their backpacks and set off for the road. They were very excited about the new "Minty Van" and Elliott began by insisting on getting into his carseat unassisted by yelling, "I do myself!" Any time we let them pretend they were able to do this task by themselves it added about 30 unplanned minutes to our trip. 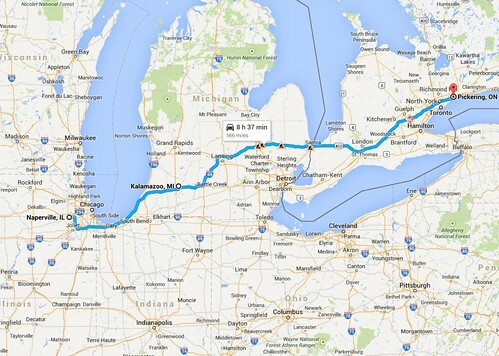 We then made the drive to Kalamazoo, MI which was one of the shorter legs of our trip. Auntie Lisa met us at the hotel downtown where we had lunch and checked in. For some reason they spent the first twenty minutes in our hotel room calling out the Kalamazoo Fire Department for not throwing them their own personal parade. After a nap we went to Bell's where I had an inadvisable beer flight after not drinking any water all day. While it was quite enjoyable it lead to an annoying headache the entire second day of our trip. 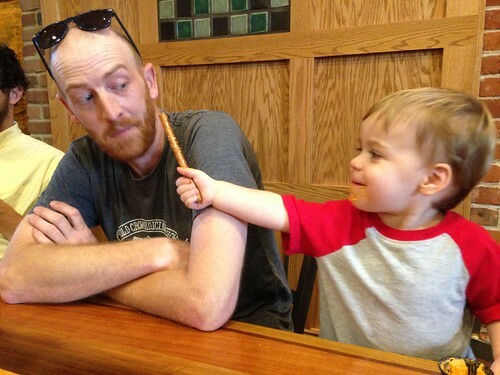 Elliott had a blast feeding Uncle Adam pretzel rods against his will. The next morning we set out for Toronto and crossed our fingers that all our passport tribulations had been done acceptably. Other than a predictably cold reception from the border crossing agent it all went well. 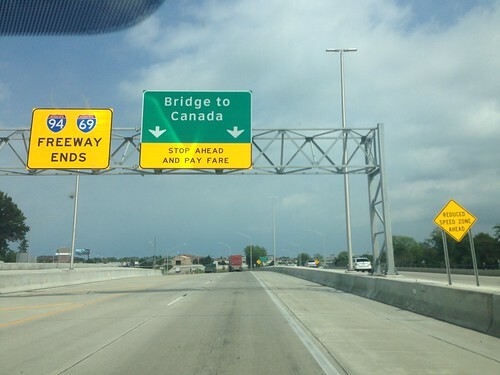 Martin was napping as we got to the border but Elliott was awake to marvel at the Bridge to Canada. "That's a really big bridge!" was his exuberant declaration for the next few days. 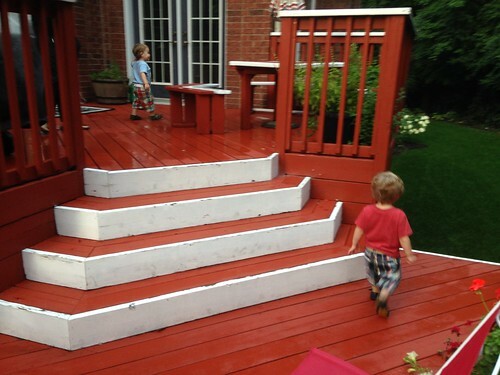 They then ran roughshod over Uncle Glenn and Aunt Wendy's house, deck, and neighborhood. They taunted, followed, and yelled at passing joggers on the bike path saying, "Good morning!" Apparently the time zone change affected them more than we'd foreseen since it was after 7:00 PM. 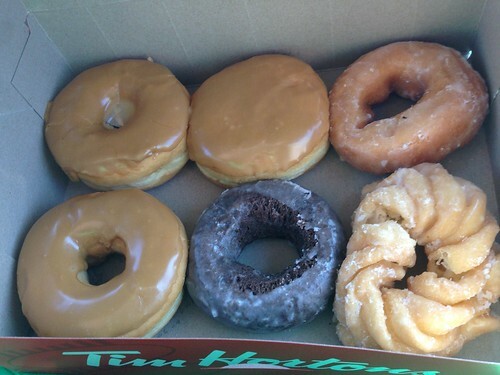 The next morning we stopped by Tim Horton's and got some Canadian maple doughnuts to celebrate the old country. While Jen was inside getting breakfast Elliott sang "No More Monkeys Jumping on the Bed" to kill some time. 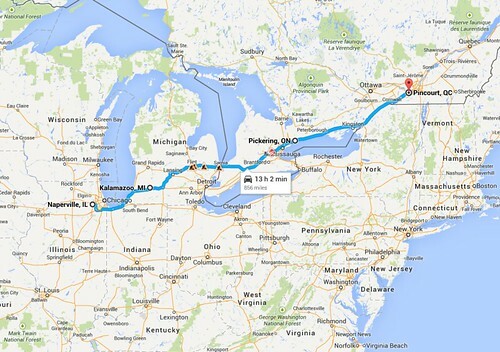 We then set out on the road to Montreal. 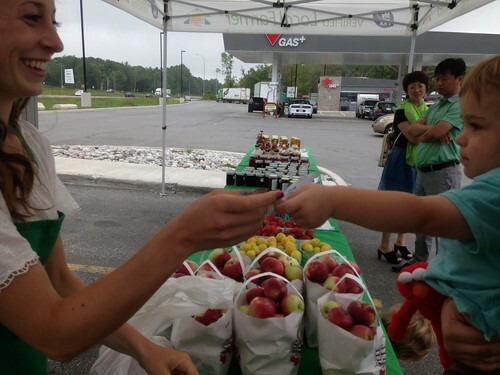 We stopped along the way to pick up some Ontario apples and peaches and Elliott insisted on treating us and paid the lady at the farmer's market. The boys were losing their minds along the road so we stopped by the St. Lawrence to look at the canal. When we opened the car to look at the seagulls our car was taken over by about a dozen wasps. I had Jen flee with the boys while I drove our wasp-infested car to a safer area and chased them all away. I hate the St. Lawrence river for all time. On our way to see our family I stopped by my favorite beer store in the entire world, Le Gobelet to stock up on some tasty Quebec beers. 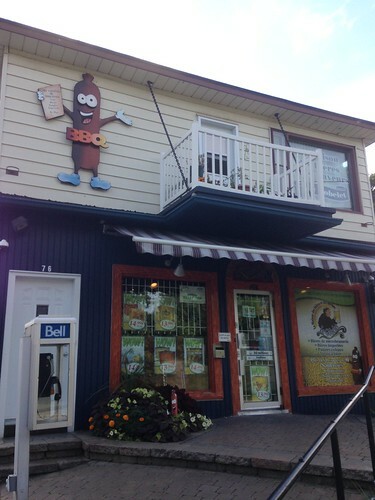 This is the store, a mere eighteen months earlier, that began my Quebec Beer Belly which still resides pleasantly in my abdomen. 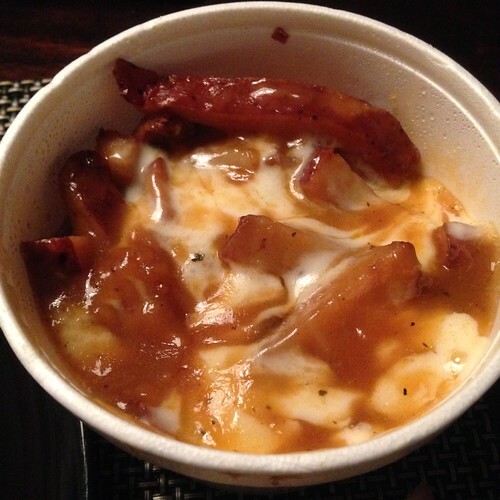 That night we got poutine from Smoke Meat Pete. The boys wrapped up their first day of the Quebec leg of the trip with their first ever smoke meat. The last time we came they weren't really eating that much solid food and Smoke Meat Pete was closed. In the morning they got their first Montreal bagels. At least their first bagels in Montreal. I'm sure they've had some at some point or another while their mother was trying to enjoy one and they steamrolled over her to claim it for themselves. 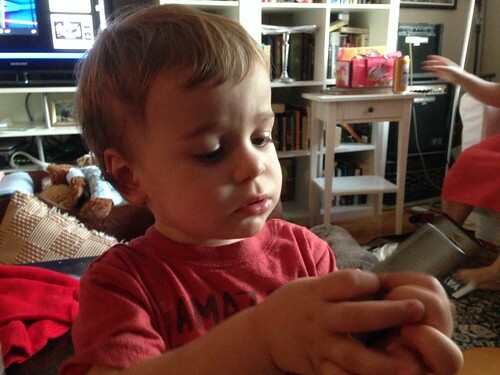 That morning we went to go visit Great Grandpa and they quickly tore apart his apartment, stealing his toys, figurines, decorations, and anything else they could get their hands on. We went out to lunch at Le Manoir where the boys drank large quantities of chocolate milk and stomped around the outdoor dining area. That night we met at Aunt Nancy and Uncle Jim's where they were immediately captivated by this magnetic farm toy on the fridge. We looked up the identical toy on Amazon and it was selling for somewhere north of $170 so we opted to let this toy be merely a happy memory. 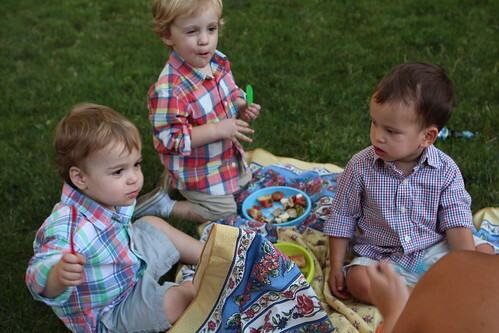 The boys mostly ran around and played the entire time but did take a two minute breather to come enjoy some of Grandad's cooking on a blanket in the yard. We then got to have one of the finest Mille Feuilles ever made for Nana's birthday. The next day the kids all went to the splash pad. Elliott was the only one brave enough to go into the water portion, even if he was mostly just moderately annoyed by the whole thing. It was a hot day so I was more excited than the kids to enjoy the water. Martin and Jackson only really played in the sand. That night, after some shopping, we had another cookout at Anne-Marie and Dan's. 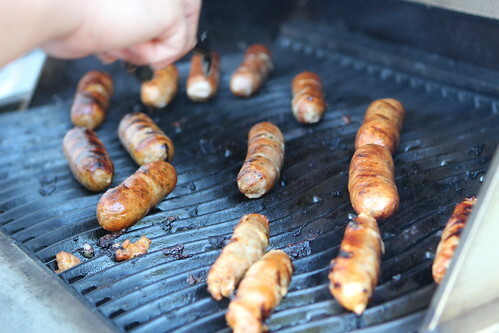 Along with the good company we cooked up some saucisses we picked up at Le Gobelet. We got five different varieties but failed to segregate them in a way where we had any idea what we were eating after they were all cooked. All but the Merguez were something of a mystery. A tasty, tasty mystery. 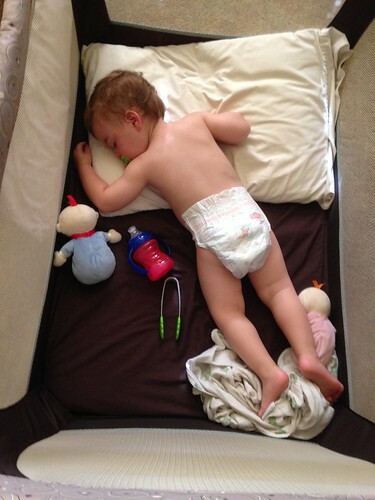 That night, against my wishes, Jen tried to get them to all sleep on big boy beds on the floor. This turned into a slumber party nightmare and lead to me having to lie with both boys on our bed until they fell asleep. The next morning we set off to New Hampshire to meet our friends Scott and Vanessa and their daughter Samara and newborn Julien. We stopped in South Burlington, VT after a failed attempt to secure some beer from The Alchemist or Lawson's Finest Liquids. We stopped at an amazing place called Al's French Frys, an exceedingly inexpensive diner-like dining experience with amazing old fashioned French fries. There's a big outdoor eating area with a playground making it great for stopping on the road with two rambunctious toddlers. 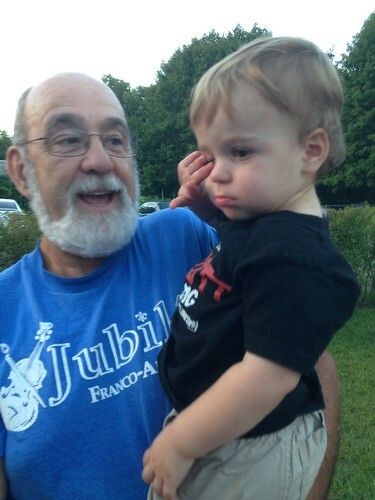 We met up with the family in New Hampshire and Martin really enjoyed meeting Julien and holding him. A week later he would bring up, out of the blue, about how he held Julien and how Julien was wearing an octopus shirt. Elliott, liking to be independent, said hi to the baby then proceeded to scale a chain-link fence, a skill neither of us were aware he had. The fence surrounded a dog run and he expressed his dissatisfaction that the dogs were gone each time he reached the top. 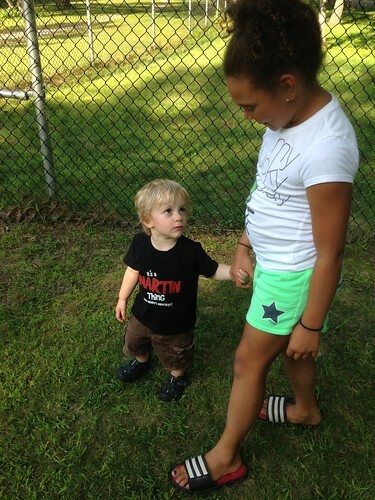 Martin also had fun with Samara as he is immediately enamored with big kids and only wants to hang out with them. 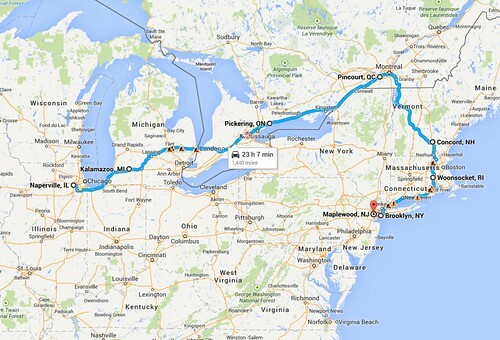 We then hit the road and headed to Rhode Island to see family there. The day ended up being an eleven hour drive (with stops) so they boys were pretty worn out. Nana and Grandpa were thrilled to see the guys in Rhode Island for the first time in a year. We went to see Uncle Jeff and Aunt Liza that night. After some fun I fell down the stairs on my way to the car and lay in the grass for a while, wondering if I should even bother getting up. My back hurt far too much to consider the possible damage to my pride. After a few minutes we made it back to my parents' house where I groaned myself to sleep on the air mattress. The next day we got a visit from Aunt Pat and Debbie who brought them gifts. They both went crazy for their new toy grill. Unfortunately the grill was not designed for twins so they were locked in a bitter struggle for control over the one set of tongs it came with. This lead to my mother bringing them some regular cooking tongs which went a long way to easing tensions between the two. Unfortunately Elliott woke up in the morning with some pain so we had to take him to the pediatric urgent care down the street. Luckily he was made to feel better quickly, mostly by tearing apart the waiting room. The doctor that saw him happened to be my pediatrician as a child who, oddly, recognized me. After tests we got some medicine to give him and we were able to enjoy the rest of the afternoon. Jen used this time to go to the doctor for her scratched cornea and accidentally hit my parents' porch with the rental car. In the course of 24 hours, the vacation had claimed 3 out of 4 of us as casualties. They would not nap, however, without their new grill toy. Martin got all the grill and foods. Elliott got the tongs. I'm pretty sure Elliott felt like he won out in this instance. 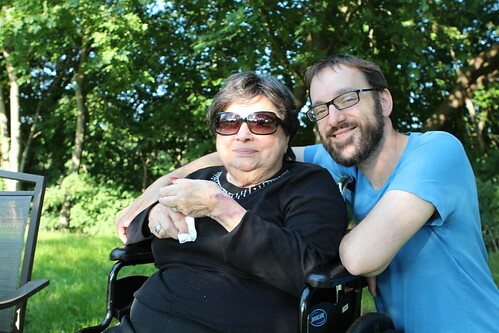 Auntie Vi was able to come and visit which was great. While the boys weren't quite as willing to let everyone hold them as the first time they visited, it was still good to see everyone. The next day we took a trip to the petting zoo/park where they got to look at a large number of beasts. They liked feeding the animals and just generally pointing at them and identifying them. After that we headed to Aunt Pauline's for some fun in the sprinkler and playtime with their cousins. That night we got to go do dinner at Nicole and Aaron's and see Henry and Madeline who we also haven't seen in about a year. A must have for the minivan, since we were traveling well over 2,000 miles, was a DVD entertainment system. We left Illinois with about twenty five DVDs, ready to keep the boys occupied. What ended up happening was that they only wanted to watch Frozen. We put on Beauty and the Beast which they tolerated as they looked out the windows. They watched about ten minutes of Wall-E, however, the only thing they were interested in watching was Frozen. They requested it repeatedly. And when we went to Nicole & Aaron's they were blown away to see it on the big screen again. This may have been the highlight of the trip for them. The next morning we got an early start for Brooklyn. We stopped by our old place for lunch then headed south to see Uncle Paul, Aunt Caolan, and Baby Jane. They had a blast with Paul and Jane, playing with new toys, and listening to stories by Paul. They also had a really good time playing the harmonica while dancing. The hotel was a disaster. I won't give the real name of the chain but let's just say that a more accurate name for the chain would be "Worst Western." While we waited for the hotel to try to remedy the fact that it had only 50% of the cribs it had promised us it would have the boys passed the time by trying to call Aunt Lisa on the phone. As far as they are concerned every phone is a direct line to their Aunt. 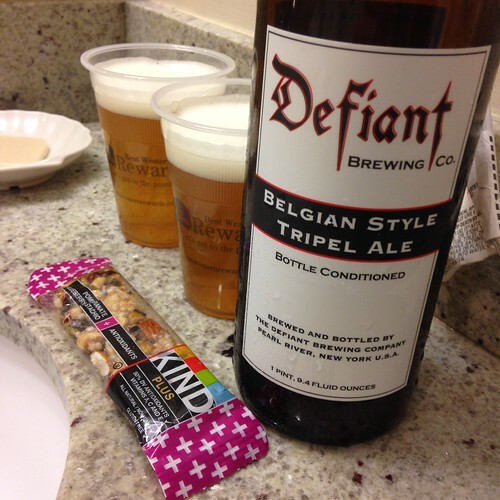 After a difficult, late bedtime we were able to treat ourselves to lukewarm beer, poured in the bathroom, then consumed in the dark accompanied by a Kind bar. Overall, not the greatest nightcap of the trip. 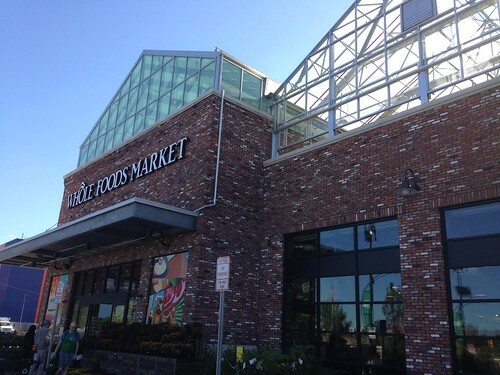 The next day we went to explore the new Whole Foods in Brooklyn. We thought this would be a short trip but the guys spent hours there and had a blast. Martin figured out how to take pictures and this is the first ever picture that he took. He needs a little work on his composition. 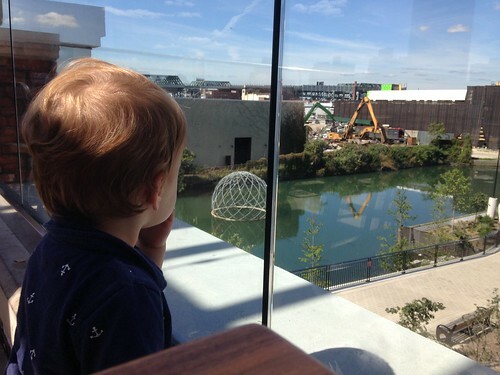 Elliott wanted to stay out on the roof deck and watch the construction site across the canal. It was the perfect construction site for kids to watch because it appeared to be a guy who was just having fun grabbing clumps of metal then dropping them ten feet to the right. In fact it may have been a kid operating the crane. In the afternoon we headed out to New Jersey for our last stop of the trip. There was a bit musical gathering in their play room where the boys got to play with the big kids. Martin sat uncomfortably close to Eli, trying to watch what was going on on his tablet and then Mallie joined him which understandably annoyed Eli to no end. Later that evening Uncle Joe stopped by and the boys created some strange dance where they pointed to the ground and repeatedly said a word that sounded like: "sessi." I'm really not sure what this was all about, but it was fun. 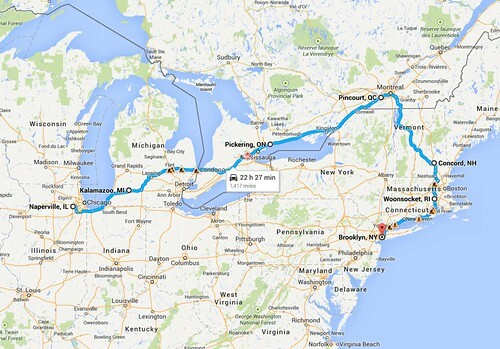 The next day my goal was to make it to Ohio. 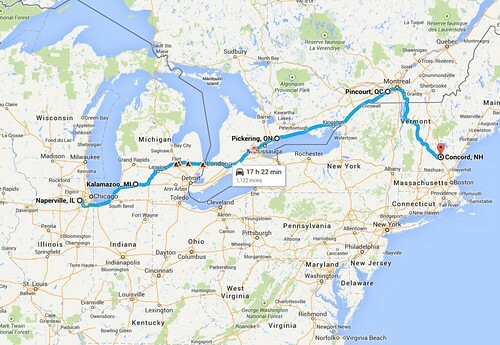 My stretch goal was to make it as far into Ohio as possible. As mid day approached it became clear that if we really pushed it we could make it all the way home, thus giving us some actual time at home to "relax" before returning to work. 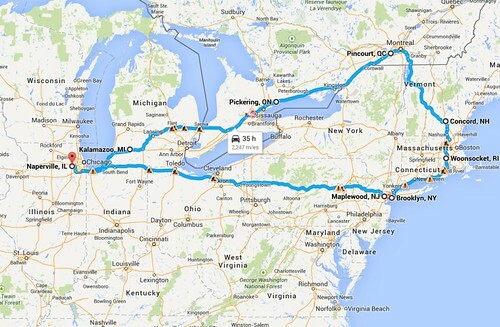 We made a few stops, including an extended play stop in Ohio to kick the ball around. 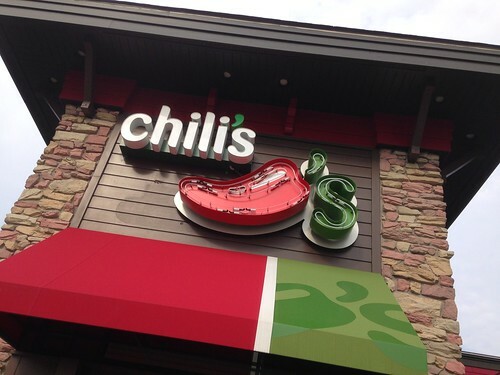 We also made a stop in Sandusky, Ohio, at a Chili's for dinner. Taking two toddlers to a sit down dinner after being cooped up in the car for eleven hours is not really advisable. They were wild and just wanted to run around so it ended up being one of the shortest and most unenjoyable dinners of the trip even though the food was actually quite good. At one point the hostess actually cleared our table before our dinner arrived because there was no one there. This scored us an extra round of chocolate milks and a refill on our chagrin. If you're ever at the Chili's in Sandusky, Ohio, please tip them generously. They still deserve it. We returned home around 11:00 PM and got the chocolate-milk soaked boys into their cribs before collapsing. We woke up the next morning and observed the disastrous overgrowth in our garden. 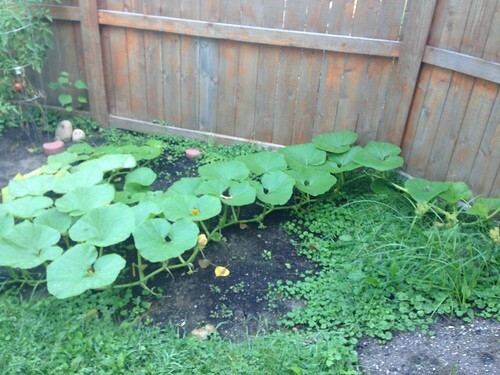 The pumpkin vine had begun to take over much of our yard. We had a good amount of work ahead of us in order to start harvesting some of this overgrown disaster. Martin woke up yesterday feeling sick. After throwing up a few times he mostly just napped and watched cartoons. By dinner time he seemed to have returned to his normal activities for the most part but the family barbecue had to be canceled. It was probably for the best that they got a somewhat quiet night after the chaotic last few weeks. In a Final Destination style way the vacation had claimed us all as casualties but all things being equal I was surprised at how well it went. I think in another year we may be mentally prepared to try something like this again.